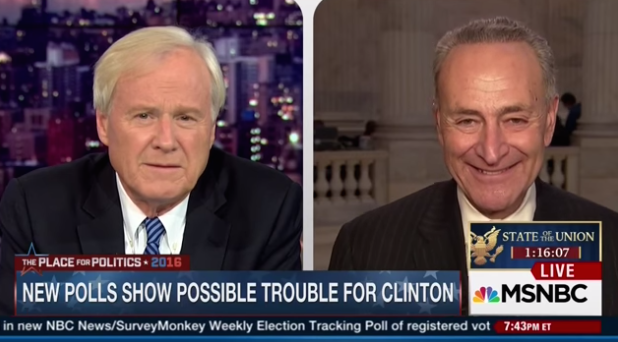 MSNBC Hardball host Chris Matthews’ quest to find a Democrat to define the difference between a socialist and a Democrat continued on Tuesday when he asked Sen. Chuck Schumer (D-NY) to do so. Matthews: What’s the difference between a socialist and a Democrat? Schumer: Oh, it depends how you define each one, doesn’t it? Matthews: Well, you do it. Schumer: Well, I’m not going to get into it. Matthews: Why not? …Debbie Wasserman Schultz, the chairman of the Democratic Party won’t answer my question. Hillary Rodham Clinton. You guys are well-schooled in political language and nomenclature. You’re quite capable of defining the difference between a socialist, self-described and a Democrat self-described. What is it? Schumer responded by saying he had nothing bad to say about his socialist colleague, Sen. Bernie Sanders (I-VT), whose campaign is surging in Iowa and New Hampshire. Schumer added that Sanders is the real deal, though he never gave a definition nor talked about the difference between a socialist and a Democrat. Matthews suggested that maybe the solution to the inability of Democrats to define this difference would be for the party to change their name to the Social Democratic Party, which didn’t go over to well with Schumer. In the meantime, Matthews will keep searching for a Democrat to answer his question.